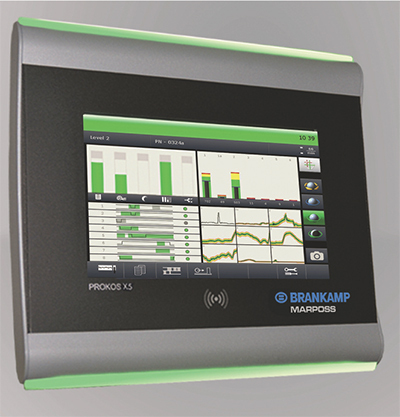 Marposs, Auburn Hills, MI, has debuted its Brankamp X5 in-process, real-time monitoring systems for cold- and hot-forming, thread-rolling, and stamping operations. Building upon the capabilities of its X1 and X3 models, the X5 units feature a large 12-in. touchscreen as well as Tool Memory that stores data used for precise machine setup for repeated production runs. The trend toward lightweight construction and increasing part complexity can result in higher deformation levels. These units help identify manufacturing faults as well as part or tool variations, enabling manufacturers to optimize machine efficiency, improve part quality, and limit unplanned downtime and tooling costs. Here’s how the X5 works: Sensors in the machines, positioned to convert energy into electrical signals that monitor tool and machine performances from applied forces, provide the systems with information used to learn the normal limits of the process. The control unit then observes the signals of each cycle and compares those with the stored curve. When the signal moves outside of the envelope curve, the formed part is sorted out, or the machine is stopped. Each X5 allows the user to input the type of machine monitored and features eight channels for sensor signals displayed as maximum forces, envelope curves and trend progressions. Additionally, six zoom channels offer detailed monitoring of specific, sensitive process areas such as distorted parts or a short feed.